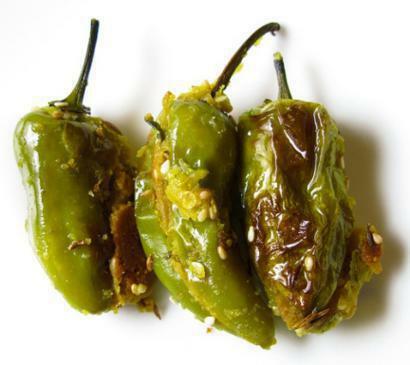 Fresh hot green jalapenos, averaging 2 ½ inches (6.5 cm) long and 1 inch (2.5 cm) wide, are available in most areas. If their skin has begun to turn red but is still shiny and firm, they are still quite usable. Smaller chilies are inevitably the hottest, especially serranos, and they are next to impossible to seed and stuff. Use jalapenos or the conical fresnos (usually limited to California markets). Srila Prabhupada once commented to his servant-cook Srutakirti das. “Chili pakori and fried chilies are cooling in hot climates; they actually reduce the body temperature”. They are also recognized as appetite stimulators by inhabitants of the tropics. 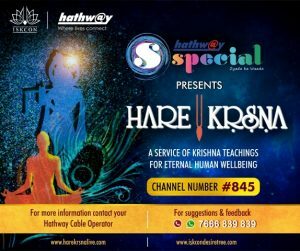 If you fancy hot foods, by all means give this dish a try on a full Vedic menu. Warn the unseasoned newcomer, and, depending on personal tolerance, allow 1 or 2 per person. 1. Wash the chilies and pat them dry. With a sharp paring knife, make a cut from the top to the bottom of each chili, cutting halfway through. Carefully pry out the seeds and membrane, then wash the cavity under running water and pat dry. 2. Combine the mustard, turmeric, salt, cumin, garam masala, chickpea flour and enough yogurt to make a paste. Mix well. Spread the paste evenly into the cavity of each chili. 3. Heat the ghee or oil in a 1-quart/liter saucepan over high heat until it reaches 360 F (180 C) on a deep-frying thermometer. Fry the chilies 4 at a time for 2-3 minutes or until they blister and turn brown. Note: Remove with a slotted spoon and drain on paper towels.